Ahead of its official unveiling on 5th September, Safaricom has highlighted some of the key areas addressed by their sustainability report. The report gives an in-depth analysis of the company’s stakeholders and its business ecosystem. Major areas touched by the report are human rights, good labour practices, support for the environment and anti-corruption. The company has aligned its practices such that they are in line with the principles of the UN Global Compact. Safaricom’s CEO, Bob Collymore was appointed to a 3 year term as honorary member of United Nations Global Compact Board. With this initiative the UN is encouraging businesses to adopt socially responsible practices. To engage their stakeholders, information on Safaricom’s practices is being made publicly accessible. It is therefore easier for stakeholders assess the company’s practices. Safaricom is already recognized by NEMA as the most environmentally compliant telecomms firm in the country. Already the company is making efforts to even the ratio of male to female employees currently standing at 1:1.3. They have committed themselves to recycling electronic waste, using renewable energy (over 4% of its sites already use green energy) in their operations and reducing the amount of carbon emissions in running their equipment. Sustainability reporting is the main focus of the Dow Jones Sustainability Indexes (DJSI). Currently tracking 2500 companies, the DJSI provides a reference point for investors who want to invest in companies operating in a sustainable and ethical manner. Listed companies are selected based on their long term economic strategy, environmental asset management and social plans. According to Aly-khan Satchu social responsible investing (SRI) has outperformed normal investing by the amount of capital in business and in terms of strategy. 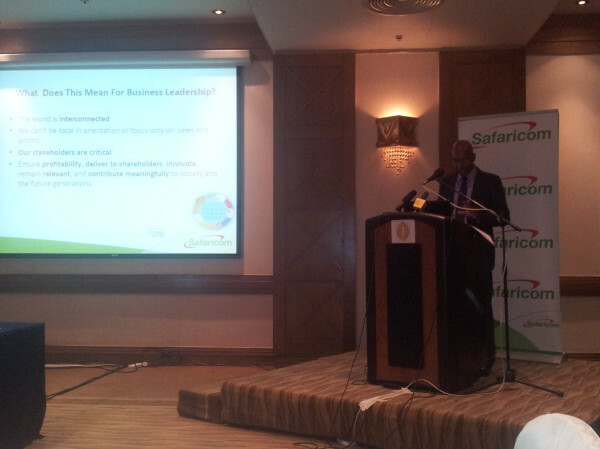 Some of the companies noted for SRI in Kenya are Safaricom, Nation Media and KCB.